This tutorial describes the meaning and use of Population Stability Index and Characteristic Analysis. In simple words, Population Stability Index (PSI) compares the distribution of a scoring variable (predicted probability) in scoring data set to a training data set that was used to develop the model. 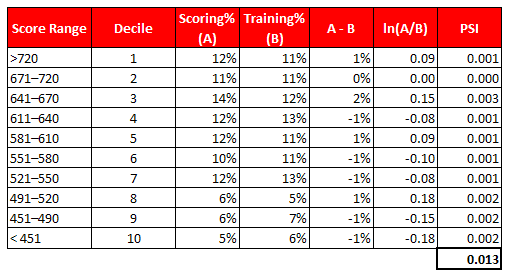 The idea is to check "How the current scoring is compared to the predicted probability from training data set". Model might be influenced by economic changes. Suppose you built a risk model during economic recession (year 2008) and you are using the same model to score datasets in year 2016. There is a high chance that various attributes of the model are changed drastically over last 8 years. It means it does not make sense to use this model anymore if features of the model are changed significantly. Change in product offerings due to internal policy changes. For example, one of your product are relaunched recently so attributes may behave differently as compared to attributes of your model. PSI can detect if any data integration or programming issues to run the scoring code. PSI < 0.1 - No change. You can continue using existing model. PSI >=0.1 but less than 0.2 - Slight change is required. PSI >=0.2 - Significant change is required. Ideally, you should not use this model any more. To understand the cause of a change, we need to generate the characteristic analysis report. Note : We can use chi-square for binned data or KS test to compare distribution of two data sets. It answers which variable is causing a shift in population distribution. It compares the distribution of an independent variable in the scoring data set to a development data set. It detects shifts in the distributions of input variables that are submitted for scoring over time. It helps to determine which changing variable is most influential in causing the model score shift. Check the direction of impact due to model variable shifts. Check the signs of the shifted attributes and the average values of those attributes compared to those from the previously scored population or development sample. This will indicate whether the model attribute shifts are increasing or decreasing the model scores. 5 Responses to "Population Stability Index and Characteristic Analysis"
Is there any rule for characteristic analysis just like mentioned in PSI. 1) psi>.25 then what will be next step.. what changes we will do to bring it back to acceptable range..